Print, scan and copy in standout color on sizes up to 11"" x 17"" using the Officejet 7740 Wide Format ePrinter for bold documents and presentations. Ideal for businesses that want a versatile all-in-one to help them show up professionally in a variety of sizes, this printer also faxes documents up to 8-1/2"" x 14"". Automatic two-sided printing, fast print speeds and an auto document feeder help ease your day. Thermal inkjet printer produces 21 black/white prints per minute and 18 color prints per minute. 35-page ADF handles documents up to legal-size so you finish duplex jobs quickly. Tap and swipe the smartphone-style color touch screen for time-saving shortcuts. Easily print documents and more from your smartphones and tablets whether Apple, Android or Windows. Easily manage printing tasks and scan on-the-go with the HP All-in-One Printer Remote mobile app. 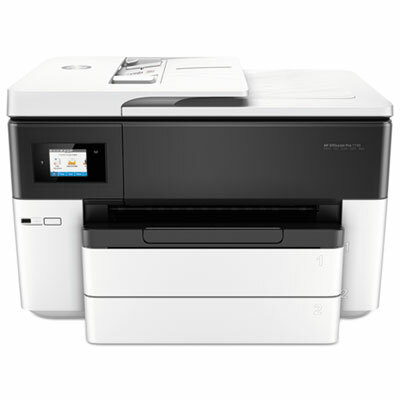 This printer with a 1.2 GHz processor also offers easy network connection so everyone in the office can print conveniently. Media Size 11" x 14"
C6 Envelope - 3.19" x 6.37"